I got home later than usual last night and we were starving, needed something to eat fast. 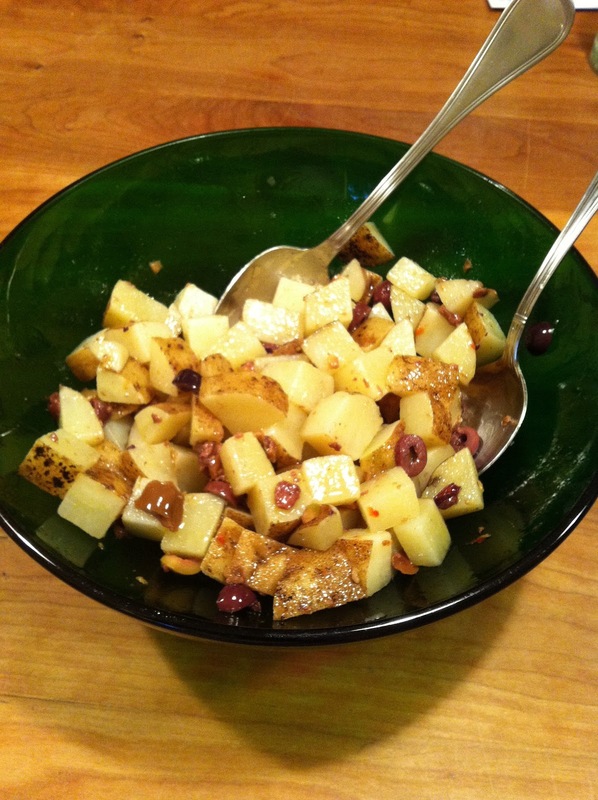 I cut up a few potatoes in half inch cubes and boiled them in salted water for less than five minutes to keep firm. Then ran them under cold water, drained, doused with great extra virgin olive oil and a couple of generous dashes of Kosher salt. I opened the fridge and saw the jar of pitted Kalamata olives which I sliced and tossed into the potatoes. So good! Instead of olives it could have easily been chopped arugula, scallions, capers, or mint from the side of the yard. Super easy, super quick, and very tasty! I served them with barbequed steak tips and a tossed salad.